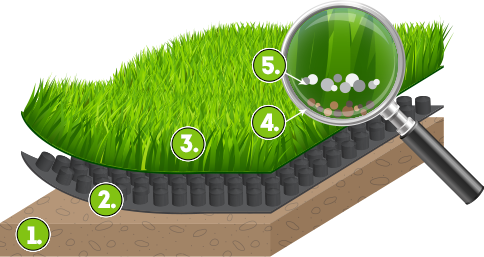 Synthetic Grass Warehouse is the exclusive national distributor of TigerTurf Landscape. Improving upon high quality natural grass: that’s the TigerTurf way. How do we do it? We conduct a series of tests on our products using the latest lab equipment, working directly with sport governing organizations as well as third party suppliers and testing facilities. All of our hi-tech innovations and expertise, including the latest yarn coating composition and idyllic pitch specifications in the harshest environments, is shared within our worldwide family. All of this is brought to a grassroots level to ensure that we can produce only the highest quality turf to match your specific requirements, both timely and competitively. Our company also believes in thinking ahead, as we are always discovering the newest ways to recycle synthetic grass products for any future projects. Don’t wait any longer! Share your needs with us so we can deliver your greatest landscaping dream today. You simply convey your needs while we create the custom system that fits them by combining our technology and delivering it to our manufacturing suite across the globe—some with ISO 9000 certification. Then, our technology is converted into products in-market for better value and effectiveness. With our manufacturers scattered globally, we pride ourselves on the utmost quality and standards in developing our products. We partner with Quality Controlled Suppliers to obtain the most technologically advanced yarns and specialty supplies for our full spectrum of products. We also pride ourselves on the fact that we possess an independent quality control certification. Our company is consistently audited to maintain this qualification. Worldwide technology at the grassroots level—it’s how we cater to our markets. Provide a flat and level surface that’s firm yet forgiving. Synthetic Grass: Realistic, durable, and low maintenance alternative to natural grass. Safe for both kids and pets. Envirofill Infill: Advanced infill technology that’s non-absorbent, anti-microbial and anti-bacterial. Envirofill features heat resistant properties and is environmentally safe. Absorbs and transports large quantities of liquids to prevent flooding from excessive rain or watering. Realistic, durable, and low maintenance alternative to natural grass. Safe for both kids and pets. Organic infill complement/alternative that helps eliminate odor caused by repeated animal use. Advanced infill technology that’s non-absorbent, anti-microbial and anti-bacterial. Envirofill features heat resistant properties and is environmentally safe. Soft and forgiving layer installed under the turf that encourages play while maintaining safety. Made from recycled materials.